Sarah and Jay… where do I even begin?! They are celebrating their FIRST anniversary this weekend, so I figured it was more than time to share their wedding day with you!! I’ve tried to start writing their wedding blog post so many times, but I keep getting stumped at where to start in describing these two and their epic wedding day and all of the incredibly special memories I have! I am truly, truly blessed to work with couples whom I come to know, love, and adore, and Sarah and Jay are one of a kind, and they have become dear friends of mine. Their love for one another is SO real and so inspiring. They are somehow the most down to earth people but also two people who are filled with so much talent, wisdom, and all-around awesomeness. They are so inspiring both as individuals and also as a couple, and I have learned so much from them: they are such generous spirits, they have such a zest for life, they love their people so deeply, they are so thoughtful and kind, and I could go on and on. Suffice it to say, their wedding day went above and beyond all of my wildest expectations, and getting to plan and design their wedding was such a deep honor and privilege for me. I still vividly remember so many details and so much joy and love from their wedding a year ago, and I mostly know that it overflowed with sheer excitement, anticipation, happiness, love, and fun!! When Sarah reached out to me right after they were engaged, we clicked immediately. She made the entire process so much fun and so easy (seriously!! ), and I’ll never forget almost daily emails from her expressing her gratitude for me. When you work alongside someone for over a year, this means the world. I absolutely loved getting to know Sarah, Jay, and their families so well throughout their engagement, and everything came together so seamlessly and so beautifully. It didn’t hurt that I got to work alongside a true dream team of vendors (so many vendor friends who go above and beyond in countless ways!) to bring their vision and big day to life! With a soft, organic, and romantic palette of dusty French blue, creams, soft grey, and neutrals with lots of pops of navy, fun textures, and greenery, it was such a dreamy, stunning wedding. It’s hard to believe this joyous wedding day was already one year ago! What a privilege it is to walk alongside my couples throughout the engagement and on their wedding day. Getting to witness their palpable joy, excitement, and love so closely is far and away one of the happiest parts of my work, and I adore getting to know my couples so well, to plan and design meaningful, personalized details for their wedding, and to celebrate with them as they are married. 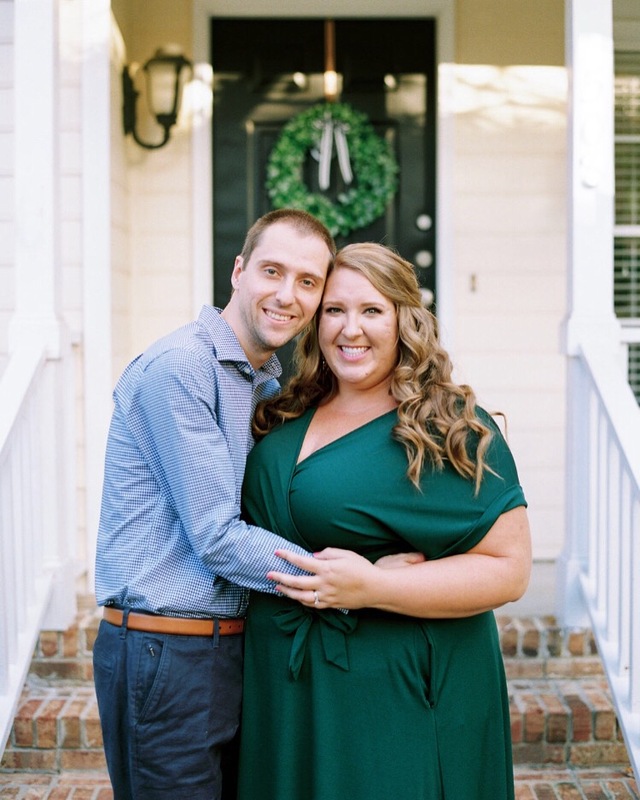 And Sarah and Jay are the real deal: there were so many intimate, genuine moments throughout their wedding day that brought tears to my eyes and the biggest smile to my face! From Sarah’s bridesmaid reveal and her first look with her dad… to their first look (we were all crying happy tears watching them! )… to the groomsmen digging up their buried bourbon… to having her cousin officiate their heartfelt, personalized ceremony… to their amazing and fun wedding party… to the toasts that showcased how special Sarah and Jay are… to the absolutely packed dance floor and killer dance moves… to witnessing SNOW in North Carolina on March 24th… it was most definitely an incredible day filled with so much pure joy and unending love! Even the pouring rain couldn’t dampen the pure elation from these two on their wedding day (and adding on a clear top tent helped a ton, of course)! That, my friends, is the heartbeat behind the work that I do: to celebrate the joyous start of strong marriages in the company of treasured family and friends! This day was pure magic; that’s for sure. Happy, happy first anniversary to Sarah and Jay — and wishing you two a million more years of love, laughter, and joy! I am so, so thankful that you chose me to plan and design your wedding, and in the process, to get to know you both so well, to be constantly inspired by you, to have amazingly fun wine and cheese nights with y’all, and to get to witness your love on your wedding day… and now in your marriage. Cheers to y’all — I love you guys! A million thanks to such a stellar team of vendors — y’all are absolutely amazing!! endless thanks to Anagram Photo for all of these stunning images!